Compilation of original albums, remixes and a BBC Studio Session LP. Also includes art prints, design posters and pocket sized photos. 50 randomly selected boxsets includes an art card signed by both Vince and Alison. Am I the only one who actually only got THREE PIECES? The vinyl box and packaging is outstanding, but I had two copies of the eight remixes vinyl and 0 copies of the BBC Sessions. It was a mix-up I guess. But I'm rather miffed about it. I am happy to see Mute releasing and re-releasing some of the classic stuff. That is understandable, and as Daniel Miller himself put it in the recently released, amazing book about Mute - these records have to stay available to the record buying public. So why not put out a new expanded version of the existing collections? 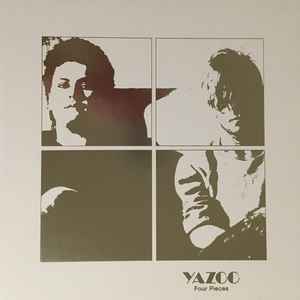 Back on Yazoo, "Four Pieces" is a good choice of title for one such retrospective collection. And this one surely does more justice aesthetically than "In Your Room". The latter was an interesting oddity of a CD box-set, celebrating their reunion around 2008 but in itself, it already lacked exclusive material, meaning - songs and demos that may have survived and could be saved from tape obscurity... One other thing that annoys on that box set is the extensive use of Arial, the horrible substitute font to Helvetica or Univers (the latter originally used on "Upstairs At Eric's" alongside the Broadway typed "Yazoo" which survived to the present day as the duo's "brand logo" of sorts). Sadly Arial spoiled it and made "In Your Room" flimsy cardboard box look so horribly cheap and dangerously close to piracy. The end result is "In Your Room" recycled live and remixed recordings in both audio and video, over and over through its extra discs, clearly showing Yazoo were a respectful but far too short-lived to deliver anything beyond the two official albums and a batch of singles, whose b-sides were again taken from albums. Funny that "The Other Side of Love" happened to be a non-album A-side single released between the two albums, and "Ode To Boy" that originally appeared as its exclusive b-side later ended on "You And Me Both" (which is actually a better decision). The only proper available b-side is the lonesome "State Farm" (originally paired with "Nobody's Diary"), which already reappeared on a number of CD releases in the last 20 years (starting with the single's CD re-release and the "Only Yazoo" compilation from 1999), while the ultra obscure "Get Set" and "Chinese Detective" happen to continue slipping through. Even "State Farm" and "The Other Side Of Love" are omitted in original form from this LP set, leaving the lot somewhat incomplete. The Peel Sessions and Jensen sessions will surely be of some consolation for this occasion but some of it was available previously as well. Generally "Four Pieces" is something the newer generation of listeners will appreciate more - and for that, it is surely welcome. I can’t help but feel this is another cash in from BMG. They did similar with the Erasure catalogue, and even Depeche Mode re-releases are afoot, with the recent first 2 album releases 12” collections. IMHO, In Your Room is the collection I cherish, and I’m lucky to have a signed copy too. I can’t see the remastered 2018 versions being so superior to the 2008 remasters. Also, for a compilation album with all the hits, listen to Reconnected. I love this album. Live. Most of the hits from the 2 albums. And all sounding excellent, especially on headphones.